Last week, Memphis had temperatures in the teens. In fact, some nights we got down in the single digits! We got out of school Friday due to concerns about the kids waiting on buses, walking to school, and being outside in general. While some laughed at this concept, I felt that the safety of the students was a concern, knowing how many of my kids walk to school. 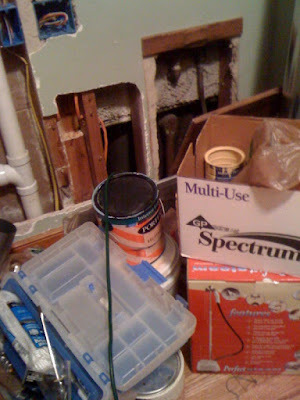 We had been keeping our faucets dripping throughout the day and night because of a worry of freezing pipes. Yet even with doing this, our pipes froze... Our bathroom sinks, toilets, and back shower had no cold water. Somehow our front tub was fine and the kitchen/laundry was fine as well. I wasn't too surprised because we've got a huge hole in the side of our house where the plumber created a new access point for our crawlspace. It was covered with just plywood. We wrapped some of the pipes prior to the freezing but it didn't help, I guess. We even kept cabinets open. It was just that cold under there. So what did we do? Well we were clearly worried about the pipes bursting. 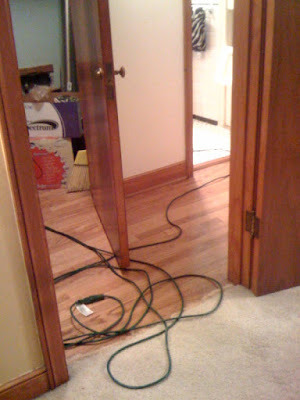 So we snaked an extension cord through the hole in our wall (more on why that is there later) and Jake crawled under the house to plug a blow dryer in to the cord. He tried blow drying the pipes - you don't want too much heat or else they'll crack apparently. After trying out the blow dryer, Jake borrowed a space heater from his parents. Ultimately that worked and our pipes thawed. Jake made sure to set the space heater on a cinder block for safety and we turned it off when we weren't home. We also turned it off overnight. So, for now we're out of the danger zone with our pipes. I sure am glad to have an operable toilet again! !